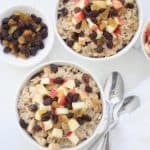 A warm, sweet and satisfying breakfast to power you through your day! Prep Ingredients: Cut the apples into small 1/2″ cubes. Make sure to remove the seeds! Set aside. Make Oatmeal: Over medium heat, in a large deep pan, heat the almond milk and salt until the almond milk is steaming (but not boiling!). Then add the oats to the almond milk. Cook over medium heat until the oats have absorbed all the almond milk while stirring occasionally. This can take anywhere from 5-12 minutes depending on the size and temperature of your pan. Then reduce the heat to low. *When reheating the oatmeal, add 1-2 Tbsp. of water or almond milk to the oatmeal, microwave for 1 minute, stir and enjoy!